As I watched Bayern Munich earn a deserved, last-gasp winner over Real Madrid in the Champions League semifinal, one thing dawned on me: the diversity of German football is incredible. Interestingly enough, both Real Madrid and Bayern Munich had their fair share of the starting eleven for Joachim Low: Khedira, Ozil, Boateng, Muller, Kroos, and Gomez, to name a few. Even there, in those names, we can see the diversity: African, Spanish, Turkish, and of course German. I grew up in the days of Franz Beckembauer as coach, Juergen Klinsmann, Thomas Hassler, Lothar Mathaus and Andreas Brehme on the pitch. Those were German names and their style, athleticism and resolve was purely Germanic, so to speak. A beautiful mix of strength and preciseness that is still present in the Bundesliga. Things began to change in 2001 when Gerald Asamoah was introduced to the world as the first black, African-born player to ever suit up for the German national team, as Erwin Kostedde and Jimmy Hartwig, two previous internationals, had one black and one white parent. In 2002 and 2006 we were also introduced to two Polish-German players: Miroslav Klose and Lukas Podolski, respectively. A newer, faster mode was thus installed on a German style that would see even more flux within the 2006-2010 World Cup cycle. 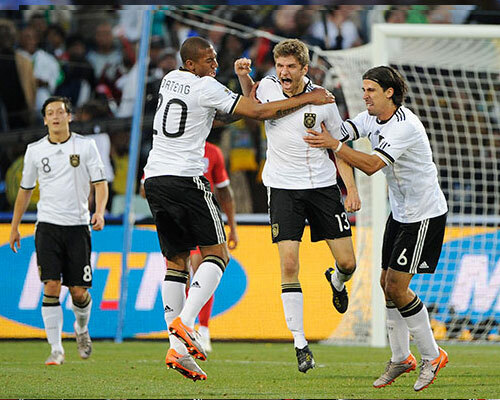 By the time the 2010 World Cup in South Africa started, Germany had been rejuvenated and reinvigorated by Joachim Low, following Klinsmann's departure. Some of the more impressive players were Sami Khedira and Mesut Ozil, both not German-sounding names. It just so happens that Germany has a sizable Turkish community in its territory and now the new generation of players is beginning to add more color to the German flag. Ozil, described as Germany's "Zidane," has exploded onto the world scene and, at 23, has only just begun his career. There is another breed of German player these days, with Mario Gomez as a perfect example. A German parent and a foreign parent. For Mario, his father is from Grenada and his mother from Germany, making him eligible for both countries. He eventually chose Germany over Spain. On that note, there are certain players Americans are familiar with: Jermaine Jones, Daniel Williams, Terrence Boyd, Fabian Johnson. The "German" connection has served the American team well, but these players had the choice of country to play for. Indeed, Jermaine Jones once played for the full national team but was never fully a candidate behind a deep midfield. Fabian Johnson also played for the youth German levels and exercised his option to switch nationalities. The new Germany is more like the rest of the world, a slew of colors interwoven and unraveled, tall and athletic, slim and fast, black and white and every color in between. For a country with the burden of unfounded hatred, the colors of this German team serve as a piece of redemption for such a beautifully complex society. Nice and balanced look at the German team.